What if Brian Hoyer had never been injured? The Cleveland Browns are currently preparing to take on the Jacksonville Jaguars in the third game of what could be a season-defining five-game stretch. But while the team’s focus in on the Jaguars, there is a potential franchise-altering decision looming on the horizon: namely, what to do with quarterback Brian Hoyer? Hoyer will be a free agent after this season and both the Browns and Hoyer’s representatives are trying to figure out just what Hoyer’s value is to the team. The subject came up this week after a story from Jason Cole at Bleacher Report came out stating that Hoyer would not resign with the Browns as long as fellow quarterback Johnny Manziel remains on the roster. Hoyer wasted little time in debunking the story. As for Hoyer not wanting to be in Cleveland in Manziel is here, we have a hard time believing that. Hoyer has moved around so much; Cleveland is home to him; and he seems to have a great relationship with the coaching staff, especially head coach Mike Pettine and offensive coordinator Kyle Shanahan; that it is hard to see him wanting to start over again next season somewhere else, all things being equal. When you weigh all that against putting up with the media falling all over itself to interview Manziel every Friday, or even worse, interviewing third-string quarterback Connor Shaw about Manziel, it seems like a small price to pay. With the way that Hoyer has played so far this year – Top 10 in quarterback rating and yards per attempt, only one interception – it is easy to say the Browns should have locked Hoyer up with a new contract in the off-season. (In fact, friend of the program Mike Burgermeister makes some very valid points at 603Brown.com on this very subject.) But with the team not having any idea just how Hoyer would play following his ACL tear, and the fact that he only played 10 quarters before he was injured, make it difficult for the two sides to determine a fair value. Now that the season is well underway, it seems unlikely that Hoyer and his agent, Joe Linta, would accept anything other than top dollar if the Browns made an offer. In addition to Hoyer, Linta represents Baltimore’s Joe Flacco, who played out his contract two years ago because he was willing to bet on himself. That bet paid off as Flacco led the Ravens to the Super Bowl and was rewarded with a megabucks contract. If Hoyer were to pull off that same feat and lead the Browns to their first NFL title since 1964, we’re betting that the Browns would be willing to discuss a new contract that, while maybe not in Flacco’s neighborhood, would at least be in the same ZIP code. The Browns find themselves facing what could be a franchise-making decision because of last season’s franchise-altering injury to Hoyer. We started thinking about that chain of events this week while interviewing someone for a story we are working on. During the interview, the person mentioned he has been reading the book, What If? : The World’s Foremost Military Historians Imagine What Might Have Been, a series of essays that reflect on monumental events of the past and examines how things might have turned out differently. 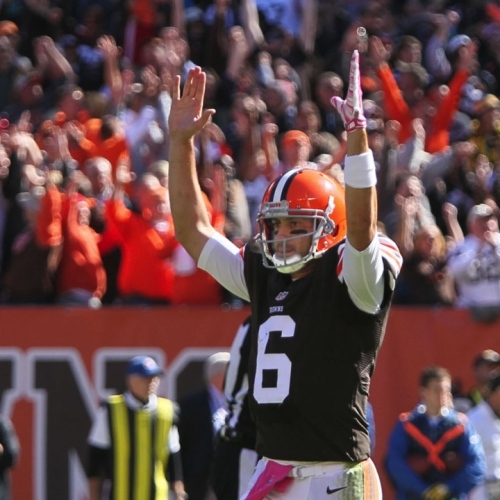 Which got us thinking … What if Hoyer had never been injured? With the way that Hoyer had played up to the point where he tore his ACL against Buffalo, there is little doubt that Hoyer would have remained the starting quarterback – especially given the alternatives. The Browns probably still would have led the NFL in pass attempts – even Hoyer’s magic wouldn’t have been strong enough to help out the worst rushing attack in franchise history – but the results would have undoubtedly been better without Jason “Moral Victory” Campbell and Brandon “Flipper” Weeden throwing those passes. With Hoyer running the offense, it is unlikely that the Browns would have closed out the season by losing 10 of their final 11 games. With a better record, Rob Chudzinski would still be the head coach and Norv Turner would still be the offensive coordinator, meaning we probably would not see the commitment to the running game that has been a refreshing site this season. That means that Joe Banner and, presumably, Mike Lombardi would still be in the front office, which means the team probably would not have signed Karlos Dansby, Donte Whitner and Andrew Hawkins in free agency, and who knows what they would have done with the draft. There is no doubt the Browns are in a better place today with Hoyer at quarterback, Pettine on the sidelines and Ray Farmer in the front office. How long that trio stays together in the Orange and Brown will go a long way in determining of this franchise is really back on the right track. But no pressure or anything, on the new contract guys.